Nebula possibly discovered 1610 by Nicholas-Claude Fabri de Peiresc. Independently found by Johann Baptist Cysatus in 1611. Trapezium cluster found as multiple star by Galileo Galilei in 1617. The Orion Nebula Messier 42 (M42, NGC 1976) is the brightest starforming, and the brightest diffuse nebula in the sky, and also one of the brightest deepsky objects at all. Shining with the brightness of a star of 4th magnitude, it visible to the naked eye under moderately good conditions, and rewarding in telescopes of every size, from the smallest glasses to the greatest Earth-bound observatories as well as outer-space observatories like the Hubble Space Telescope. It is also a big object in the sky, extending to over 1 degree in diameter, thus covering more than four times the area of the Full Moon. As it is so well visible to the naked eye, one may wonder why its nebulous nature was apparently not documented before the invention of the telescope. Only some Central American, Mayan folk tales may be interpreted in a way suggesting that these native Americans may have known of this nebulous object in the sky (O'Dell 2003, p. 3). However, the brightest stars within the nebula were noted early and cataloged as one bright star of about fifth magnitude: In about 130 AD, Ptolemy included it in his catalog, as did Tycho Brahe in the late 16th century, and Johann Bayer in 1603 - the latter cataloging it as Theta Orion in his Uranometria. In 1610, Galileo detected a number of faint stars when first looking at this region with his telescope, but didn't note the nebula. Some years later, on February 4, 1617, Galileo took a closer look at the main star, Theta1, and found it to be triple, at his magnification of 27 or 28x, again not perceiving the nebula. The Orion Nebula was probably discovered in late 1610, when Nicholas-Claude Fabri de Peiresc (1580-1637), a French lawyer, turned his telescope to this region of the sky, and reported of a cloudy nebulosity. This sighting, however, was not published, but only reported in Peiresc's personal documents and brought up only by Bigourdan (1916). It was independently found in 1611 by the Jesuit astronomer Johann Baptist Cysatus (1588-1657) of Lucerne who compared it to a comet he had observed in the year 1618 (Cysat 1619). This work also did not get widely known, and opnly turned up by Rudolf Wolf in 1854 (Wolf 1854). The first known drawing of the Orion nebula was created by Giovanni Batista Hodierna, who included three stars; these are probably Theta1 as well as Theta2A and Theta2B. All these discoveries apparently got lost for some time, so that eventually Christian Huygens was longly credited for his independent rediscovery in 1656, e.g. by Edmond Halley who included it in his list of six "nebulae" (Halley 1716), by Jean-Jacques d'Ortous de Mairan in his nebulae descriptions, by Philippe Loys de Chéseaux in his list, by Guillaume Legentil in his review, and by Charles Messier when he added it to his catalog on March 4, 1769. It is somewhat unusual that the Orion Nebula has found its way into Messier's list, together with the bright star clusters Praesepe M44 and the Pleiades M45; Charles Messier usually only included fainter objects which could be easily taken for comets. But in this one night of March 4, 1769, he determined the positions of these wellknown objects, (to say it with Owen Gingerich) `evidently adding these as "frosting" to bring the list to 45', for its first publication in the Memoires de l'Academie for 1771 (published 1774). One may speculate why he prefered a list of 45 entries over one with 41; a possible reason may be that he wanted to beat Lacaille's 1755 catalog of southern objects, which had 42 entries. Messier measured an extra position for a smaller northeastern portion, reported by Jean-Jacques d'Ortous de Mairan previously in 1731 as a separate nebula, which therefore since has the extra Messier number: M43. As the drawings of the Orion Nebula known to him did so poorly represent Messier's impression, he created a fine drawing of this Object, in order to "help to recognize it again, provided that it is not subject to change with time" (as Messier states in the introduction to his catalog). This gorgeous object continued to influence astronomers since. It was the first deepsky observation by William Herschel with a self-constructed reflecting telescope of 6-foot focal length in 1774. In 1789, with some prophetic touch, he described his observations with his 48-inch aperture, 40-foot FL scope as "an unformed fiery mist, the chaotic material of future suns." The gaseous nature of the Orion Nebula was revealed in 1865 with the help of spectroscopy by William Huggins. On September 30, 1880, M42 was the first nebula to be successfully photographed, by Henry Draper. Consequently, on March 14, 1882, Henry Draper obtained a second, better, deeper, and more detailed photograph of the Orion Nebula, a 137-minutes exposure, which also clearly shows M43. The Orion Nebula is located at a distance of about 1,600 (or perhaps 1,500) light-years. At this distance, its angular diameter of 66x60 arc minutes corresponds to a linear diameter of about 30 light-years. On its northern end, the nebula is devided by a conspicuous dark lane, well visible in our photograph. This image was obtained David Malin of the Anglo-Australian Observatory. More information on this image is available. The detached northeastern portion is the nebula M43 first reported by De Mairan, and listed as a separate nebula by Charles Messier. Like the main nebula M42, this is an emission nebula, shining by the light emitted from its atoms, after being excited by the high-energy radiation of massive, very hot young stars within it. In the very neighborhood, to the north, there are also fainter reflection nebulae, partially reflecting the light of the Great Nebula. They were not notable for Charles Messier, but labeled later with the NGC numbers 1973, 1975, and 1977: NGC 1977 had been found by William Herschel (his H V.30), while NGC 1973 and NGC 1975 are discoveries of Heinrich Ludwig d'Arrest. 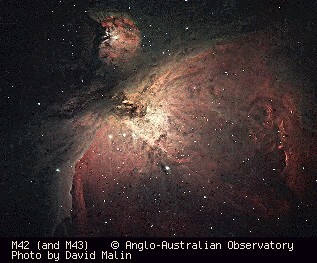 Here we have a collection of more images of M42, M43, and more images of M42, M43 and NGC 1973-5-7. The Orion Nebula is the brightest and most conspicuous part of a much larger cloud of gas and dust which extends over 10 degrees well over half the constellation Orion. The linear extend of this giant cloud is well several hundreds of light-years. It can be visualized by long exposure photos (see e.g. Burnham) and contains, besides the Orion nebula near its center, the following objects, often famous on their own: Barnard's Loop, the Horsehead Nebula region (also containing NGC 2024 = Orion B), and the reflection nebulae around M78. Already impressive in deep visible light photographs, the Orion Cloud is particularly gorgeous in the infrared light. M42 itself is apparently a very turbulent cloud of gas and dust, full of interesting details, which Charles Robert O'Dell has compared to the rich topography of the Grand Canyon in his HST photo caption. The major features got names on their own by various observers: The dark nebula forming the lane separating M43 from the main nebula extends well into the latter, forming a feature generally nicknamed the "Fish's Mouth". The bright regions to both sides are called the "wings", while at the end of the Fish's Mouth there's a cluster of newly formed stars, called the "Trapezium cluster". The wing extension to the south on the east (lower left in our image) is called "The Sword", the bright nebulosity below the Trapezium "The Thrust" and the fainter western (right) extension "The Sail". 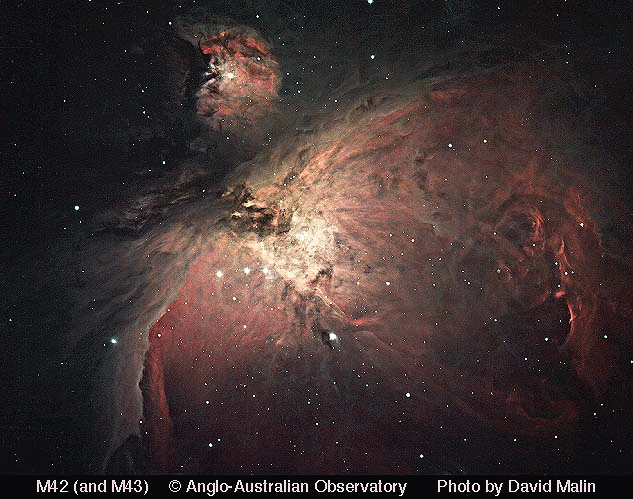 Here we have a small collection of Images of detail in M42, including another nomenclature for the brightest region in the nebula by historic visual observers, as well as a pictorial study of the Trapezium cluster and region by Lowell Observatory images. The Trapezium Cluster is among the very youngest (open) clusters known, with new stars still forming in this region. As stated above, the cluster was first depicted as triple star on February 4, 1617 by Galileo, who was not aware of the nebula. Galileo's discovery did not get widely known, so that Christian Huygens independently rediscovered the triple star in 1656 together with the Orion Nebula. These first three stars are often labelled "A", "C", and "D". It may be of interest that in both cases, the Trapezium, or Theta1 Orionis, was second to only one other double star: Mizar (Zeta Ursae Majoris). The fourth Trapezium star, "B", was first found by Abbe Jean Picard in 1673 (according to De Mairan), and independently by Huygens in 1684. The fifth cluster star "E" was discovered by Friedrich Georg Wilhelm Struve in 1826 with a 9.5-inch refractor in Dorpat, the sixth, "F", by John Herschel on February 13, 1830, the seventh, "G", by Alvan Clark in 1888 when testing his 36-inch refractor of Lick Observatory, and the eighth, "H" by E.E. Barnard later in 1888 with the same telescope. Barnard later found that "H" is double, with two 16th-magnitude components. Today we know that stars "A" and "B" are both eclipsing variables of Algol type: A (also known as V1016 Ori) was discovered in 1975 to vary between magnitudes 6.73 and 7.53 with a period of 65.4325 days, while B (also cataloged as BM Ori) varies between mag 7.95 and 8.52 in 6.4705 days, and is always the faintest of the four Trapezium stars. The past decades of research on the Orion Nebula have revealed that the visible nebula, M42, the blister of hot, photo-ionized, luminous gas around hot Trapezium stars, is only a thin layer lying on the surface of a much larger cloud of denser matter, the Orion Molecular Cloud 1 (OMC 1). We happen to see this structure approximately face-on. The idea for this model came originally from Münch (1958) and Wurm (1961) and fully elaborated by several authors around 1973-1974 (Zuckerman (1973), Balick et.al. (1974)), soon supported by evidence, and is still studied in detail, see e.g. O'Dell (2001) for a recent review, and references cited therein. The San Diego Supercomputer Center (SDSC)'s VisLab has created a 3-dimensional visualization of the Orion Nebula based on this model (see side-view model image of M42). The Orion nebula was, continuously since the early times before its refurbishment, a preferred target for the Hubble Space Telescope. One major discovery was that of protoplanetary disks, the socalled "Proplyds" (planetary systems in formation) in these HST images of M42 (these images were used for an animation simulating the approach to a protostar [caption]). HST images of November 1995 have revealed further insight into the complicated process taking place in this "star factory". Hubble investigations of January 1997 have revealed interesting interactions of the young hot Trapezium cluster stars with the protoplanetary disks: Their violent radiation tends to destruct the discs, so that the lower-mass stars forming here may loose the material needed to form planetary systems. In 1982, a symposium solely devoted to the Orion Nebula was held to celebrate New York University#s Sesquicentennial, and to honor the one hundredth anniversary of the first photograph of the Orion Nebula taken by Henry Draper on September 30, 1880 (Glassgold et.al. 1982). An excellent review of the astrophysics of the Orion Nebula is provided in 2003 with the superb monograph by Charles Robert O'Dell (O'Dell 2003), who summarizes the knowledge of that time, including HST research. It is very easy to find the Orion Nebula, as it surrounds the Theta Orionis multiple star or cluster, seen to the naked eye in the middle of the sword of Orion. Already under fairly good conditions, the nebula itself can be glimpsed with the naked eye as a faint nebulosity around this star. The Orion Nebula is also one of the easiest and most rewarding target for amateur astrophotographers. Bill Arnett's Orion Nebula M42/43 photo page, info page. New Orion Nebula distance and New Orion Nebula distance, Part Two, essays by Ken Croswell (2007). Guillaume Bigourdan, 1916. Comptus Rendus, Vol. 162, pp. 489-490 (Jan-Jun 1916). Johann Baptist Cysat, 1619. Mathematica astronomica De Loco, Motu, Magnitudine, et Causis Cometae qui sub finem anni 1618 in coelo fulsit. Ingolstadt. Edmond Halley, 1716. An Account on several Nebulae or lucid Spots like Clouds, lately discovered among the Fixt Stars by help of the Telescope. Phil. Trans., Vol. XXIX (29), pp. 390-392. Available online. Rudolf Wolf, 1854. Ueber den Nebelfleck im Orion. Astronomische Nachrichten, Vol. 38, No. 895, col. 107/108. [ADS: 1854AN.....38..107W] Announce of Cysat's discovery. A.E. Glassgold, P.J. Huggins, and E.L. Schucking (eds. ), 1982. Symposium on the Orion Nebula to Honor Henry Draper. Annals of the New York Academy of Sciences, Vol. 395. xii+338 pp.